Westfield NJ won two awards and a four-bloom rating at the recent America in Bloom Symposium & Awards Program. 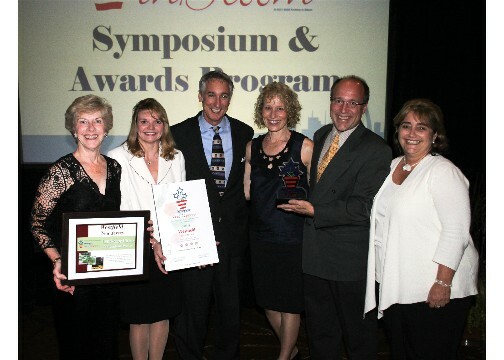 Pictured left to right: Barbara Vincentsen, Westfield resident and 2011 America in Bloom judge, Sherry Cronin, Co-Leader of Westfield in Bloom and Executive Director of Downtown Westfield Corporation, Joe Lamp'l, Executive Producer and Host of Growing a Greener World PBS series, Beth Brenner, Asst. Executive Director of Downtown Westfield Corporation, David Williams, Co-Leader of Westfield in Bloom, owner of Williams Nursery, and President of Garden Centers of America and Katy Moss Warner, Volunteer Board of Director of America in Bloom and President Emeritus, American Horticultural Society. Photo courtesy of David Williams. Westfield NJ was honored to receive the top prize for towns their size in the 2010 America in Bloom competition (locally known as "Westfield in Bloom") and won the Landscaped Areas Award for all entrants across the country. Westfield competed in 2009 and 2010 and is the only town in the state of New Jersey to compete both years. Of the 28 participating towns in the US, each town was judged on eight criteria: community involvement, floral displays, environmental awareness, heritage, urban forestry, landscape, tidiness and turf and ground covers across three sectors: municipal, residential and commercial. Judges Bruce Riggs and Marlborough Packard toured Westfield July 11-13 and met town officials, residents, volunteers, and members of the Westfield in Bloom committee. The eight criteria awards only go to one community among all the AIB entrants across all population categories. Westfield won the Landscaped Areas Award sponsored by OFA - The Association of Horticultural Professionals. America in Bloom is an independent, non-profit 501(c)(3) organization dedicated to promoting nationwide beautification programs and personal and community involvement through the use of flowers, plants, trees, and other environmental and lifestyle enhancements. America in Bloom provides educational programs, resources, and the challenge of a friendly competition between participating communities across the country. For more information, visit americainbloom.org or westfieldinbloom.com.